At the beginning of 2013, at 33, finding myself still single after more years than I was comfortable admitting, I set out to meet someone. I gave myself one year to be in a committed relationship. It took many agonising months and just when I had lost hope and I was about to abandon the search, I did meet someone! 2013 has been the year of The Love Project and what a formative year it has been! It’s been the year during which I challenged everything I knew and thought about love, the world and myself. And at the end of that year I came out stronger, wiser, better: a totally different person. A person who had won her battles against her fears and demons, a person who had learned how to love herself and allow for others to lover her too. Now, a bit over a year of being in a relationship, I find myself in a different kind of love project. 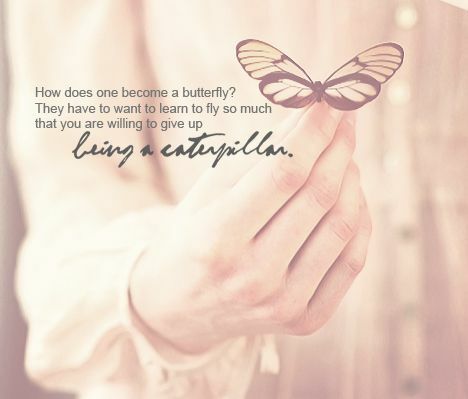 No sooner I had left caterpillar stage and emerged as a butterfly, that I found myself a caterpillar once more. Everything I had learned the previous year brought me here, in a relationship; but being in a relationship is a different ball game I am still a rookie to. But I quickly answer my own question. When you’re so close to someone that everything you think, say or do has a knock-on effect on their life, their well-being and their emotional and physical integrity, then you’ve got something big on your hands. You’ve got a power you can choose to use for good or you can choose to use for evil. And it’s in this choice that the butterfly is born again. In the acceptance that being in a close relationship with someone is the first step to being in a close relationship with the world, that fighting to shed out the past, habits, regrets, memories, and most often fighting against yourself is the greatest fight of them all. How easy it would be to take the stage door and leave the play. How easy to go back to familiar territory and stay there. How easy to find excuses why things should go back to how they used to be. But easy choices are not worth making. It’s the difficult ones that we’re supposed to face. A friend told me on a bus journey that in relationships, one needs to break oneself down into pieces and build oneself once more, from the start, with pieces of the other intricately weaved in. A metaphor that often rings so true. An exercise that takes so much away and makes you wonder, how much of myself I am willing to let go of? How far can I push my limits of acceptance? So maybe I need a new project. A new set of lessons I must commit to learn. New layers of old stuff I must shed. New pledges of acceptance, forgiveness and giving that I must make. New demons I ought to face. New boundaries that I must erase. The battle never ends. And that’s the beauty of life. That there’s always another challenge waiting for us in the next chapter. That there’s always another limit that we must push! If you’d like to see me speak about The Love Project, join us at the Unconventional Convention, an event themed around Pushing Your Limits, on 7th Dec, at The Book Club in Shoreditch. For tickets click here!